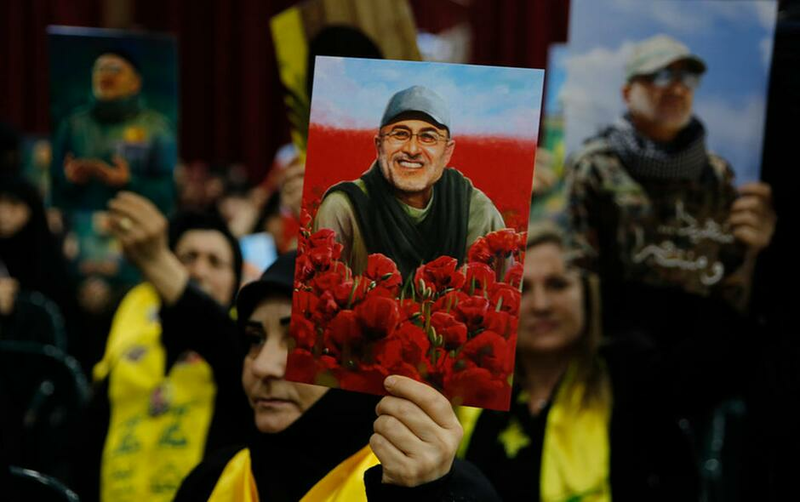 Women hold pictures of slain Hezbollah top commander Mustafa Badreddine, who was killed in an explosion in Damascus, as they listen to Hezbollah leader Sheik Hassan Nasrallah, during a ceremony to mark the second anniversary of his death, in the southern suburbs of Beirut, Lebanon, Monday, May 14, 2018. Nasrallah said a barrage of rockets from Syria against Israeli forces in the occupied Golan Heights last week opens "a new phase" in the conflict, warning that Israel proper could be the target next time. BEIRUT (AP) — The leader of Lebanon's Hezbollah said Monday a barrage of rockets from Syria against Israeli forces in the occupied Goal Heights last week opens up "a new phase" in the conflict, warning that Israel proper could be the next target for retaliation. Hassan Nasrallah said that Israel has been informed through an international body that retaliation inside Israel will take place if it crosses "a red line" in Syria, without providing specifics. Israel on Thursday unleashed a heavy bombardment against what it said were Iranian military installations in Syria on Thursday. It said it was retaliation for an Iranian rocket barrage on its positions in the Golan. It was the most serious military confrontation between the two bitter enemies to date. In a televised speech to a rally in Beirut, Nasrallah did not say who carried out the rocket fire into the Golan. He called it retaliation for "Israel's continued aggression against Syria." In past weeks, Israel is believed to have carried out a number of strikes against military bases in Syria, killing Iranian and Syrian troops. "You as an enemy will not be able to continue to target Syria and the axis of resistance without retaliation," he said, adding, "This qualitative rocket attack establishes for a complete new phase" in the conflict with Israel. The axis of resistance is a reference to Iran and its allies, Syria, Hezbollah and other allied armed groups in the region. Nasrallah said Israel has downplayed its losses in the strikes, in which he said 55 rockets hit military targets in the Golan for the first time since Israel and Syria had reached a cease fire and a disengagement agreement in 1974. Israel had said it downed 20 rockets coming from Syria. He said Israel's retaliation mostly hit a number of posts in Syria that had already been evacuated. He said Syrian air defenses downed a number of Israel's missiles. He said the barrage "broke the prestige" of Israel and that the attack, Israel's response and its response against Gaza protests on Monday show it is far from ready to face its opponents. "If anyone is afraid of war in the region, it is Israel," Nasrallah said. He also blasted Bahrain's foreign minister, calling him an "idiot" and a "traitor" for supporting Israel's right to respond to the barrage of rockets coming from Syria. Nasrallah called the creation of Israel, which marks 70 years of its creation Monday, a "mark of shame" for humanity. He said the pressure from Israel and the United States on Iran is not just because of its nuclear program, but is in essence because of its support to the Palestinians and other "resistance" groups. He urged the Palestinians not to accept any new U.S. peace plans.